Platinum-certified and critically acclaimed Atlanta rapper Derez De’Shon will launch the “Beat The Odds” headline tour this fall. Tickets go on-sale this Friday, September 28 at 12pm local time. The tour kicks off October 30 in Oakland, CA, performs in major markets coast to coast, and comes to a close on December 9 in Jackson, MS. Special guests will be announced in the coming weeks. The full itinerary can be found below. 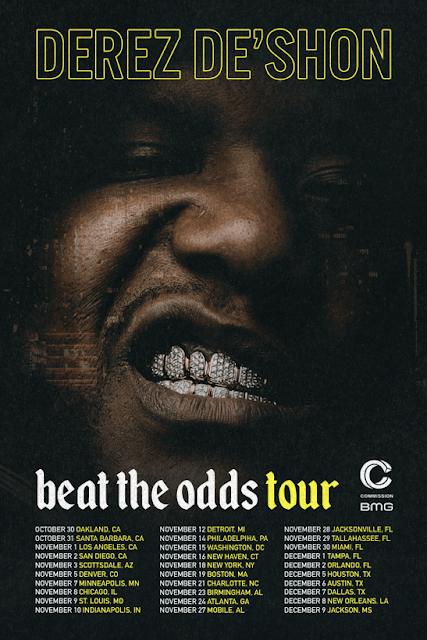 The tour sets the stage for the release of Derez’s anxiously awaited upcoming new album for Commission Music/BMG. As the MC hits the road, he continues to make headlines and break through to the masses. He recently took home the coveted “Social Star Award” at the 2018 BMI Awards. Meanwhile, his breakthrough mixtape Pain has generated a staggering 500 million streams worldwide with the single “Hardaway” cracking Top 5 at Urban Radio, racking up 88 million YouTube views, and earning a platinum certification from RIAA. At the same time, “Fed Up” quickly closes in on gold status with 23 million YouTube views. What’s more, earlier this year Derez made his television debut with a pair of appearances on Wild N Out and BET Music Awards 106 & Park Special. In anticipation of his upcoming project, he just dropped the video for "Beat The Odds" [feat. YFN Lucci]. Over sweeping piano and a delicate beat, his hypnotic voice takes hold on the empowering hook, “I’m just trying to beat the odds.” Meanwhile, he serves up the catchy, confident, and confessional bars he’s become synonymous with during the verses. See Derez De’Shon beat the odds as he continues his climb to the top of the game. Coming out of poverty, standing down adversity, and moving like a champion in the face of it all, Derez De’Shon has steadily risen through the ranks to become one of Atlanta’s most inimitable talents. With an ironclad flow, raw bars, and vivid lyrical honesty, he transformed the 2018 mixtape Pain into a phenomenon with half-a-billion total streams and his first platinum plaque for “Hardaway.” Acclaimed by everyone from XXL to HotNewHipHop, he’s primed to leave a lasting imprint on hip-hop in 2018 and beyond.